Fr. Ken comes to us from Our Lady of Perpetual Help in Lumberton and St. Joseph's in Poplarville where he has served since 1998. 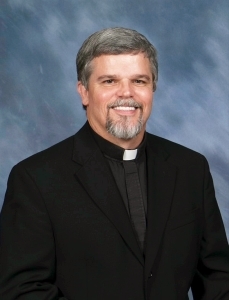 He has also served in Laurel, Waynesboro, Ocean Springs, Bay St. Louis and Pass Christian as seminarian, deacon, intern and "baby priest." He is a Biloxi native though he was born in Honolulu, Hawaii to Bud and Joy Landry on Dec. 11, 1954. His dad died in 1988, shortly after he became a priest in Jan. 1987. He had the privilege of honoring him with a Christian burial. His mother later married his dad's brother and now lives in Vancleave, MS. He has 3 sisters who are living and 6 brothers, "2 who adopted us and a great number of nieces, nephews and a few great nieces and nephews." He has numerous degrees including: BS in Pre-Professional Psychology with minor in Religious Studies, History and Philosophy, and a BA degree in Spanish from USM. 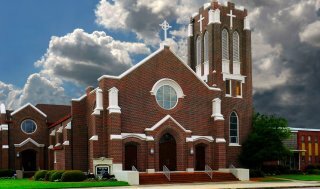 Another BA degree in Church Music and Liturgy from St. Joseph College in Rensselaer, IN. A Masters degree from Oblate School of Theology in San Antonio, TX. And the time demands of his ministry took him away from his Pre-Doctoral paper. He also serves as adjunct faculty member at St. Joseph Seminary-College. His hobbies include playing piano, composing music, gardening and reading (several books a month on theology, psychology and ministry supervision).